That is incorrect as we know. Mission Genocide is 50Hz. 50hz display, 50hz logic/game update. If only all this was 30 years ago. You are right man, CPC was the garbage colletor for Spectrum: every game was designed for Spectrum and badly ported to CPC only adding colours. CPC has demostrated that has more features than simply add color. The CPC has really been underused. What happens, is that the CPC was almost a 16 bits machine. What make it almost a 16 bit machine? That demo looks impressive but there is no actual gameplay, shame that the demo didn't turn into a real game. The actual game looks pretty horrible with speccy graphics. I think the the real game looks pretty good. Yes, it's Mode 1, but far nicer than the monochromatic Speccy version. Full color shoter with smoth scroll and full of action. CPC is very capable machine when used correctly. It looks good as a representation of the upper level (although lacks much of the foreground objects) but I'm not convinced it would have translated into the remainder of the game which is a much more traditional platforming effort. It does show that the CPC was capable of some impressive tricks in the right circumstances. Yes between a demo and a real game there is a big difference, you need to add game logic, enemies IAs, etc and most probably it would be simpler than video. However the purpose of the video is simply to show that CPC has a capable VDP, it's not simply "Speccy with more colours". You mean "Speccy with less colours" because most Speccy ports were 4 colours, or even monochrome. his graphics ability + its custom VDP. Well programmed, the CPC is best out of the 3 main 8 bits machines. That's not correct and not fair, MOST speccy games are 2 colors to avoid the color-clash disaster, and here the CPC loses 2 colors (in mode 1), and where the games use all the colors on speccy they look HORRIBLE and burning-eye-color-clash monstrosity, this way the CPC 4 color version is way better just because this horrible effect. No mention to mode 1 / 16 colors rasters or simply the mode 0 / 16 colors of the amstrad that simply destroy the not-vdp speccy character display. We are talking preciselly about that, CPC was underused during commercial life, most games were simple Spectrum ports and sometimes even using less colours. Interesting, how does rasterizing allow the use of more colours? I have been playing this game for 2 days and even the feeling is not being playing on a CPC but an EGA PC!! 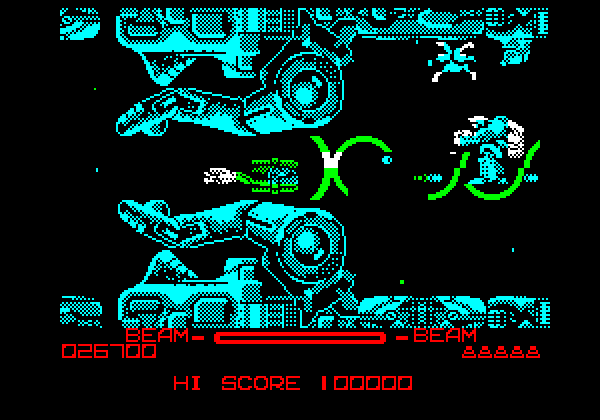 R-Type is unusual in it's use of colour on the Spectrum though. The vast majority of titles, particularly those that scroll, are monochrome. Page created in 0.411 seconds with 100 queries.